An important symbol in Buddhist teachings, the Footprint is said to reflect Buddha's mortal presence on Earth. There are over 3000 throughout Asia, some said to be natural relics, others man-made. These days Samui's man-made version is a seldom-visited attraction. This may be due to the fact there once were great views from the hillside location to the sea, but the surrounding vegetation has all but squeezed that view out. Also it is not sign posted at all. Personally we think it is worth a visit just for the journey to the site. There are roughly 150 steps that wind up the side of the hill through thick jungle vegetation. It is like a scene from an Indiana Jones movie, with the surround sound of nature complementing the image. If you plan to visit Buddha's Footprint take the left hand turn off the ring road on to the 4170 after the Hua Thanon village coming from Lamai. 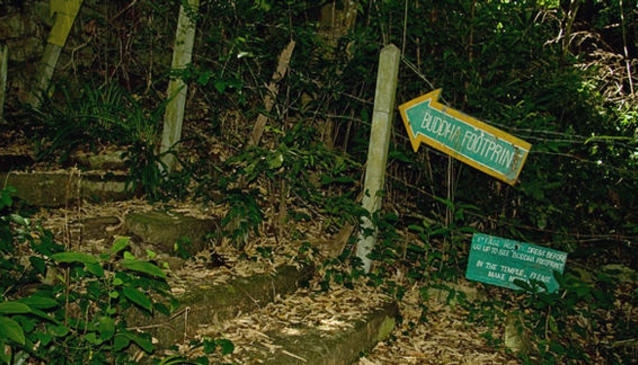 Follow the road about 1 kilometre past the turn-off for the Samui Butterfly Garden. There's a small unsigned entry to a non-descript temple on your left. On the right-hand side of the entrance you'll see some steps leading to nowhere specific, you're on your way.